Remember that saying … the most important meal of the day is Breakfast. I am a big supporter of fueling my body every 2 to 3 hours during the day to keep my metabolism running to burn the calories that I am consuming. In order to kick-start the engine … guess what … the first meal needs to hit as soon as possible upon waking. One of my favorite breakfast meals is Steel Cut Oats with Blueberries. They take a bit longer to cook but the flavor, texture, and nutrients are well worth the wait. I like to cook extra to have left over so that I can grab a perfect snack anytime to mix in my yogurt. Place 3 cups water in a large pot with a lid, bring to a boil uncovered. Add 1 cup steel cut oats, reduce heat, cover and simmer for about 15-20 minutes or until all water is absorbed. 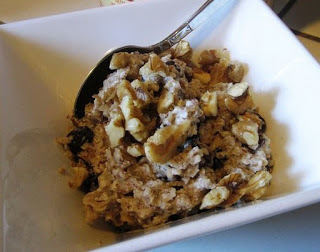 The consistency will be thick and the oats will have more of a chewy texture unlike the typical quick oats. Add frozen blueberries to the oats during the last 2-3 minutes of cooking time. Stir in the rest of the ingredients. I place ½ cup in a small bowl for my serving. Sprinkle the top with blueberries and walnuts (optional). Enjoy this fabulous tasting breakfast full of nutrient rich fiber, antioxidants, proteins, and omega 3 fatty acids.